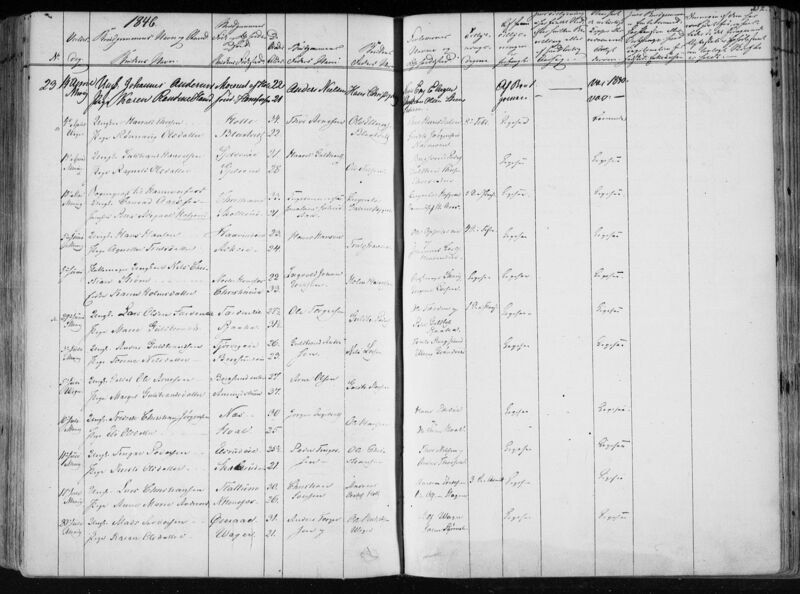 Could some kind soul help translate this excerpt from a Norwegian Birth register. Date of Baptism column reads April, then 13, then something. Possibly living in (or came from) Jelberg (maybe nowadays Fjelberg). Sandergen (?) gets a mention too. Next column (godparents) has a load of names. Next column says Uagte and then something indecipherable most likely to do with who performed the baptism. Hello - it would be helpful if you gave the year and location (parish, county) so we could look at the original. 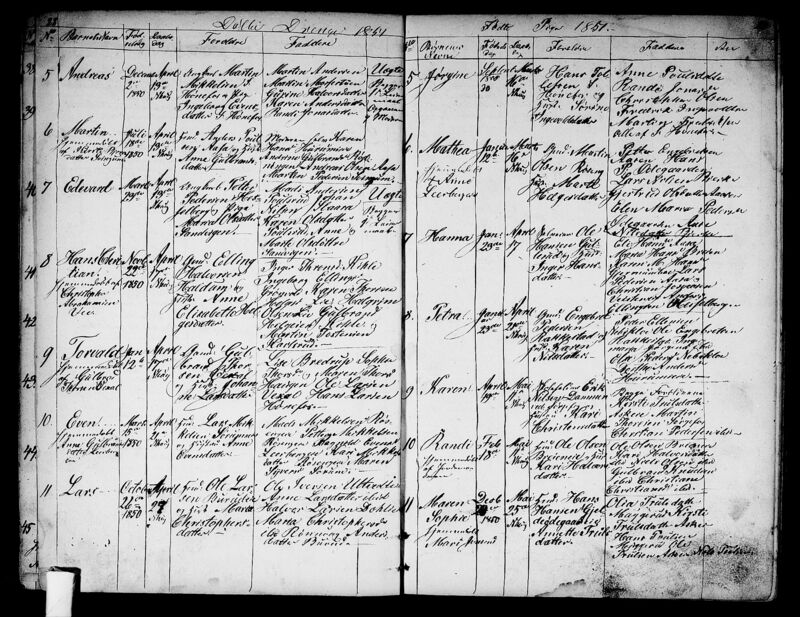 Also, my experience with Norwegian records suggests that the names after the parents' names are often farms, so Petter from (maybe) Hesselberg and Maria, Sandergren. With a parish this might be easier to verify. The word before Petter is probably his occupation, and the word "pige" before Maria usually (I think) means wife. Do you have Petter and Maria's marriage? edit: Probably not - since "uagte" means "illegitimate". Apologies for not listing the source. The following info is from the pdf downloaded from the Norwegian Archives. Maybe the farms are Hesleberg and Søndereng, both farms in the Norderhov parish mentioned in "Oluf Rygh: Norwegian Farm Names". Only thirty or so miles north of Oslo which is good as Christiania (Oslo) is also mentioned in another document. ungkarl = unmarried man, pige = unmarried girl. There's also a Maria Olsdatter in Sandvigen in 1865 (now married to Alf Olsen). Now you've shown me that each column entry should be read as one long line it makes a lot more sense. Do you think the following is Petter and Maria's marriage? Any translation would be most appreciated. There is a confirmation in Vardal in 1831 for a Maria Olsdatter baptised 1817, resident Bekimellem, parents Ole Olsen and Kari. Olsdatter, and her baptism in 1817 (residence Glæstad). 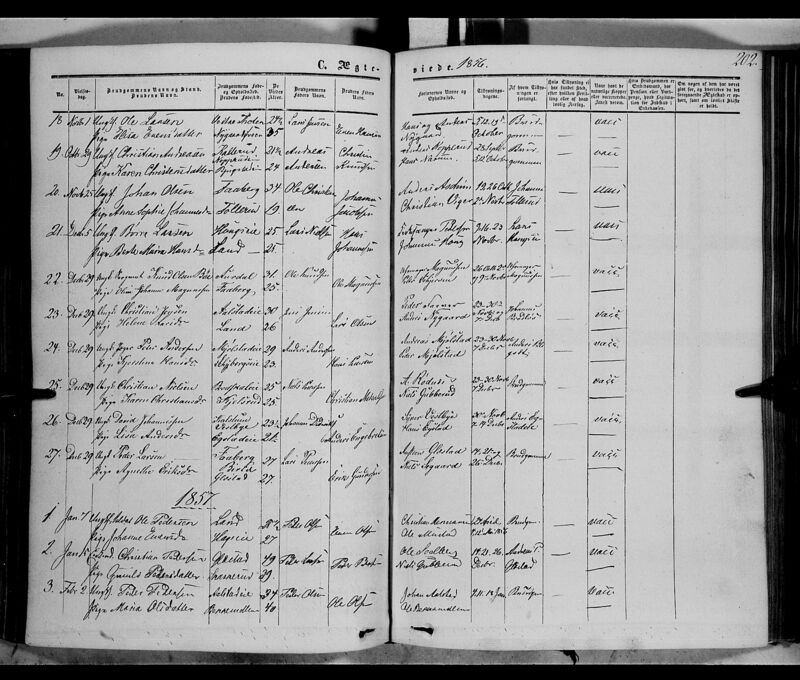 There is also a record, 22 April 1858 (after a son Peder was born and died to the couple who married in 1857) in the Vardal emigration records, of Peder Pedersen, 35, wife Maria Olsdatter, 41, moving to America (this only shows that they left the parish). No children or other relatives appear to have come with them. It looks possible (ages, etc), but it's a bit hard to tell just from this information if the 1851 couple and the 1857 couple are the same; you'd have to work out their movements between the two dates or find some common link between the two. I think the farm that Maria Olsdatter is from is Sandvigen as well. It doesn't mean where she was born necessarily, usually where she was residing at the time of the baptism. Uegte strictly speaking means unmarried. In the column where it is written 1st Le....maal which is probably leiemaal refers to it being her first illegitimate child. Unfortunately the names Maria Olsdatter and Petter Pedersen are very common and so you cannot assume that they are the couple. 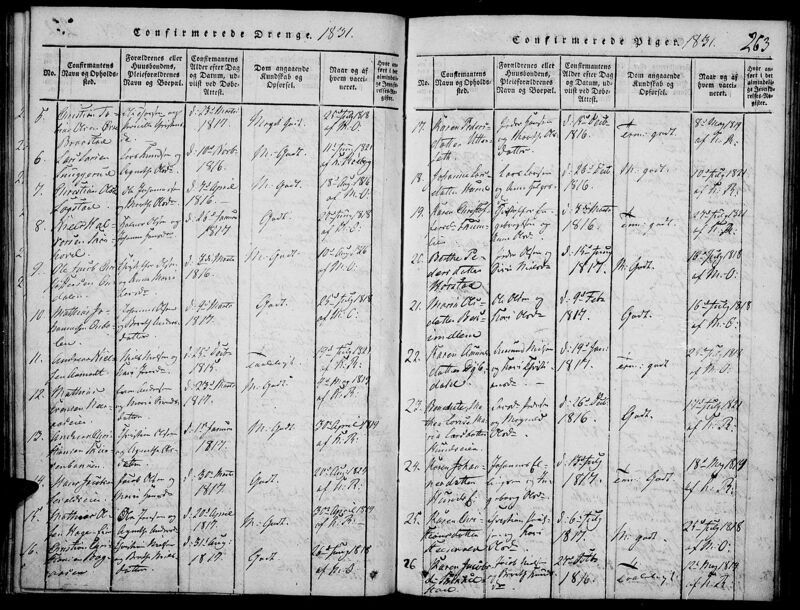 I found Edevard Pedersen living with his mother in Christiania in the 1865 census. She is 37 and apparently born in Christiania and married to someone completely different although written Chitian is probably Christian. Here is the link in case you don't have it. 1) Do you think that the final godparents listed are "Anne and Marthe" or just "Anne Marthe". Middle names don't seem all that common. 2) Do you think the spelling "OLSDOTTRE" for Anne/Marthe instead of "OLSDOTTER" is of any significance. 4) Is there a map showing the historic ***locations*** of the Farms. The "Oluf Rygh" website gives the names but I haven't been able to find an on-line site showing where the farms actually are/were. Google Maps does it's best but I'm guessing it's about 200 years out of date. How did Jorose find this out. 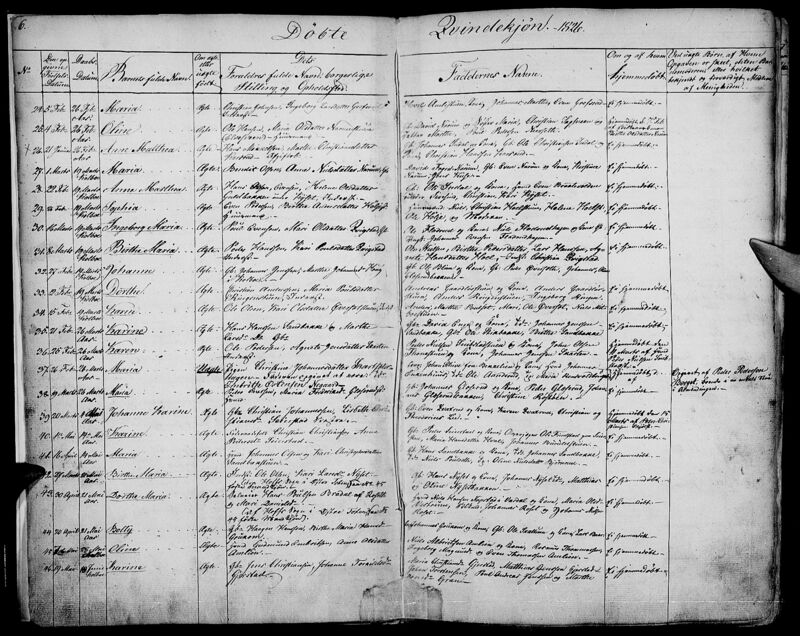 I'm assuming it's from an index search on the Norwegian archives but I can't for the life of me find out how to duplicate the search. I can search the indexes and find confirmations but not this one in particular. More than likely my ineptitude but I had to ask as I'm trying to find similar confirmation records for Anne/Marthe/Karen. Entry no.34 is for the birth of a Karen OLSDATTER. It would be nice if she was Maria's sister and Edevard's godmother. What does it say next to the parents (Overfat :-). Do you think the residence is Furuset, according to Google Maps not more than a mile from Paulsrud where Karen OLSDATTER is mentioned living on the 1851 birth register for Edevard PEDERSEN (see reply #2). Furuset is possibly also mentioned in the entry (no.33) just above Karen's (no.34). I'm hoping to link the above wedding into the whole picture. Out of interest could you tell me what the bride's father's surname is. LDS says Hendrickson which I can't see. Also can you tell me what the groom's occupation is. And is the farm called "Wager" or is that not a W.